This is just one of those blog posts that can’t stay focused. 1. Botched Execution. Apparently Arizona had a very “Oklahoma-like” moment this past week when it tried to execute a man guilty of murdering his girlfriend and her father. Click here for the WSJ’s report. It took almost 2 hours for him to die. in April the same thing happened in Oklahoma, but it only took 45 minutes for him to die there. Oklahoma has that effect on people–it makes them want to die quicker. I am not a supporter of the death penalty, and have blogged about that before (click here). However, I am a big supporter of competency. I worry about reports like this because it highlights the growing incompetency of our society. The inability to quickly and effectively kill someone by a state organization whose sole job is to put people to death is troubling. I know that there are many mitigating circumstances, but it is precisely the point that competency falls apart when too many people try to command the situation. Please note, I have no sympathy for this murderer and others like him. Instead, I worry that we can’t even perform the most basic of civil responsibilities. 2. Solar Flares. The earth was almost destroyed in 2012. No, it wasn’t the Mayan Apocalypse or the pesky rapture that never materialized. It was solar flares. Click here for the article in the Seattle Post-Intelligencer. The newspaper says that if those would have hit earth, and they nearly did, we would still be picking up the pieces. Apparently it would have knocked us back to the Middle Ages. Apparently we dodged a bullet. What overall lessons can we learn? A) The cosmos is a dangerous place. B. We probably dodge a bullet every day. C. Everything is not predictable. D. You should give thanks for today, because you have electricity and Netflix and smoothies. Tomorrow you might not. 3. Ukraine. It occurs to me that Vladimir Putin is currently playing the role of Kim Kardashian or Miley Cyrus or something. He just can’t help but be in the headlines so he will do almost anything to stay there. The MH17 shoot down was likely a mistake. I can’t imagine why anyone would want to shoot down, on purpose, a civilian airliner. What is not a mistake, though, is that the Russians are giving very powerful anti-aircraft artillery and other weaponry to people who are not really all that expert in using it, and that Russian apparently is firing into Ukraine. Click here for news story. I told you months ago that Putin was playing poker, not chess. He now knows that he has all the cards, and that the West will fold. At this juncture, it is only a matter of time before Russia annexes all of Ukraine. I suspect it will happen before the end of 2015. The only thing that will stop that is the deployment of NATO troops in Ukraine, and I just don’t think that will happen. We will not call Putin, and as we fold he will rake in the winnings. That Wall Street Journal article seems to do a fair job of outlining some of the problems with our lethal injection regimes (I just scanned the article). As drug manufacturers have become more reticent to supply the drugs (and as some drugs have come into short supply), some states have become more secretive about exactly what they’re using, for instance, and that should be profoundly troubling to anyone in a democratic society. It’s an odd thing. It’s like our culture wants to sanitize what is an inherently harsh act. So we have no more executions by firing squads, for instance. A firing squad is, mind you, a marvel of killing efficiency: alas, it’s a bit ugly too. So now we use lethal and in some cases secretive or distressingly experimental pharmaceutical methods, and, what do you know? The results are not always so sanitized. Such is the folly of man and the consequence of his efforts to control, usually in fundamentally dishonest ways, biological nature. virgil–thanks for reading and commenting. you are absolutely right in identifying the cause. i’ve been tracking this discussion here in texas for several months now and the media continues to report how difficult it is to get these death cocktails. for me, this is the point of the competency issue. a simple, and relatively easy thing like execution (even though i am opposed to it) is made nearly impossible because of the bureaucratic and societal weight. the result is the state is no longer able to do the basic tasks the state is required to do. in many regards, this is a small scale look at what the problem is with health care delivery, VA, tax reform, environmental law etc… we have specialized ourselves to the place of incompetency. i guarantee you a non specialist could have executed that guy a lot quicker and more humanely, and with much more common sense. I agree with you about competency; we owe it to society to do something right and in the case of the death penalty quickly. I have reservations about the death penalty but not enough to say it isn’t warranted in most circumstances. I would argue that we are tie our hands unnecessarily regarding the death penalty by warping beyond comprehension the meaning of “cruel and unusual”. Those who have studied history know the true meaning and reason for that prohibition and modern methods of execution do not come close to it. Not the electric chair, not the firing squad, not hanging, NONE of them. I believe that those opposing the death penalty are deliberately trying to make it difficult to execute someone by making it inordinately difficult and complicated so eventually it will be ruled cruel and unusual. That is why I don’t regard the Oklahoma or Arizona executions as ‘botched’. The criminal died. While it may not have been painless it wasn’t cruel or unusual in any regards. Solar activity has been mild lately but this incident shows just how even during the low cycle the power of the sun to disrupt everything. Many people, myself included, believe that a CME is one of the more likely “The End Of The World As We Know It” events. 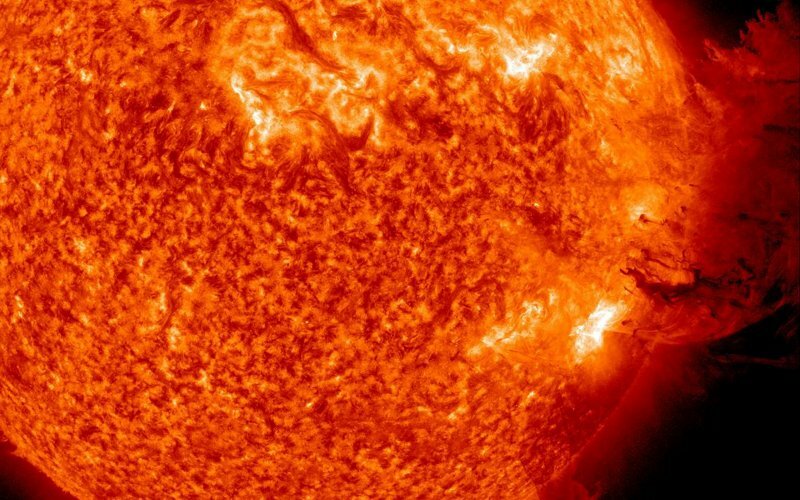 Our current infrastructure is not hardened or protected against solar flares. I would add “E, it doesn’t hurt to be prepared for a major disruption in society.” All too often we’ve seen that people are not ready for even a couple of days without power or utilities. I believe this is related to Issue #1 — we aren’t the only ones suffering from an outbreak of incompetency. I can’t imagine why anyone would want to shoot down, on purpose, a civilian airliner. They probably didn’t want to shoot down a civilian airliner but do to poor training and ability they could not distinguish between it and a military re-supply flight. And let’s not forget that incompetency is part of the reason that Putin feels comfortable playing poker with lives at stake. He’s seen the bumbling response, the lack of response from our elected leaders too often to be worried they will even try to raise the stakes. bob–i agree so much. thanks for reading and, as always, contributing good stuff to the conversation.